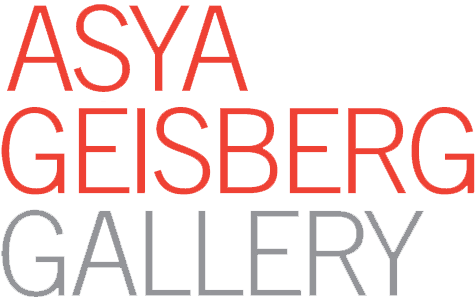 7.5" x 4.5" x 6"
6.5" x 3.75" x 4"
Asya Geisberg Gallery is proud to present "In The Pines", an exhibition of paintings, ceramics, and works on paper by Rebecca Morgan. 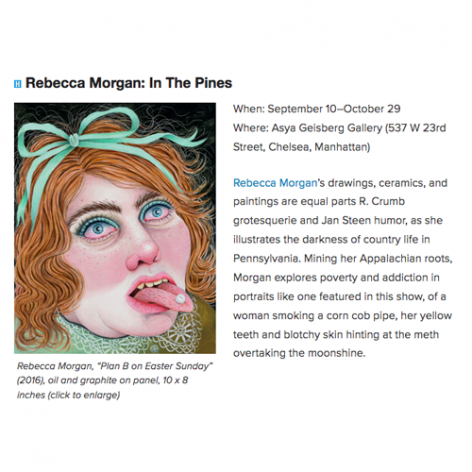 "In The Pines" presents a tapestry of hyperbolic representations and provocative stereotypes that point to abject aspects of contemporary country life and earlier romanticized tropes of rural Americana. While the artist's third solo exhibition retains the diaristic backbone of her anxieties, indulgences and dreams, Morgan enriches her palette of archetypal characters with allegorical scenes. Morgan's titular environment alludes to a place unencumbered by social norms and prying eyes, symbolizing a psychological and symbolic retreat to indulge in debauchery. 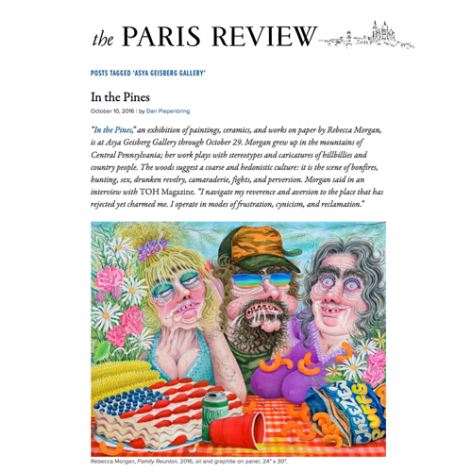 Morgan frames her detailed style between outsider art, Northern Renaissance draftsmanship, and caricature, and draws from the tradition of Goya, Mad Magazine, and R. Crumb, injecting brutal satire and uncanny humor to confront squeamish narrative truths. "Cinnabun in Bed" is perhaps the nearest approximation of this transformation of Morgan's personal rituals. We see a comically grotesque anatomically impossible figure, in an emotional nadir that we have all experienced: indulging in "junk food" at our lowest moments, bathing in self-pity. As with all good drama, specificity of the individual 's experience increases the universality of appeal. Similarly, "Plan B on Easter Sunday" conflates the gesture of taking a Communion wafer with a contraceptive pill, the Madonna/whore complex writ small. Morgan's neighbors and environs become parables and cautionary tales of country life for a knowing urban audience, a tactic much like the Dutch artists she so admires, from Brueghel to Hals. Honed with her classical rendering, each character reveals traces of Appalachian oral traditions, or of the exaggerated "types" from Beverly Hillbillies, the musical Oklahoma!, L'il Abner, and other popular representations of bumpkins and yokels. Using classical Greek sculpture as underlying poses, Morgan slyly creates her own pantheon of cultural signifiers of rednecks and hillbillies, Daisy Maes, dandies playing at farmers, Sunday painters, and innocent rubes. For instance, the painting "Family Reunion" shows a heavily caricatured trio that also look utterly familiar, while the ants, flowers and other memento mori show Morgan's harking back to the Dutch still life. Morgan's ceramic face jugs have been a growing part of her semi-fictional world. Reclaiming the vernacular art forms prevalent in her region, the jugs also function as hyper-detailed pimply portraits of blissful ignorance, or perhaps self-acceptance. Experimenting with raku, a fire-based technique, suggests an alchemy that could be straight from Morgan's witches and mountain men up to no good. Morgan's face jugs express an intangible reverence for American pastoral traditions that, like all her work, shines through in the complexity of the artist's many points of view.